Even if your invitation to Vanity Fair‘s after party gets lost in the mail, you can take the kids to the Four Seasons Los Angeles and can enjoy Oscar-worthy elegance on a family vacation in Beverly Hills. The Oscars remind most parents that they don’t get around much anymore. But a family break at the Four Seasons Los Angeles at Beverly Hills takes a bit of the sting out. Do you remember the days before becoming a parent that you may have been really focused on the Academy Awards? Since high school, I recall tearing out the list of nominees from the morning paper in late January. I spent my twenties in New York City at the Lincoln Square Cinema, Film Forum, and the Angelika theaters seeing every new independent release. Now the Oscars come and go, and I haven’t even heard of the nominations— much less seen them. Unless they are animated. 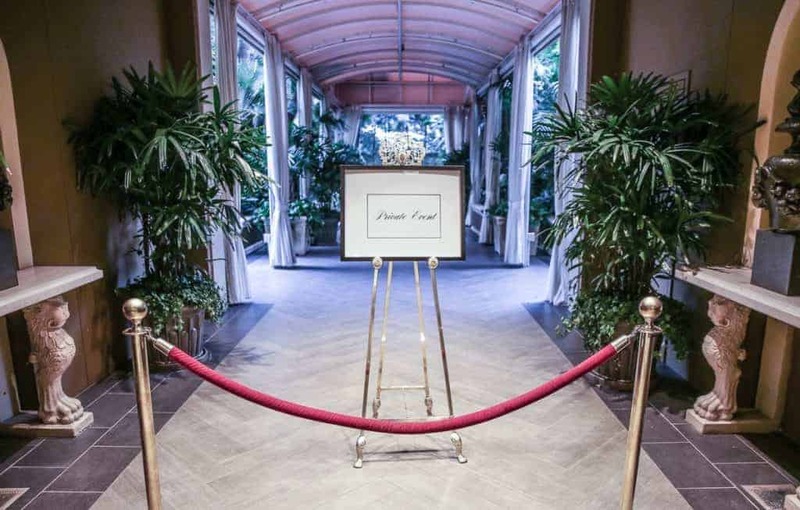 The awards season brings a heightened sense of glamour to Los Angeles, with January and February being the crunch time for the Los Angeles and Beverly Hills hotels that play a supporting role to the film industry’s most important events. But for the rest of us, we can gather our kids and check in at the Four Seasons Los Angeles at Beverly Hills. Check your dates for rates. Outside of the traditionally formal lounge area off the garden, I love that Four Seasons properties define a new luxury aesthetic. In fact, I think the brand really invented it, and I love how this and the Las Vegas properties convey this similar vibe of relaxed luxury. I am sure the Four Season Beverly Wilshire (better known as the Pretty Woman hotel) offers a contrasting vibe and is a better for those who don’t feel a hotel is luxe unless it feels traditionally opulent. 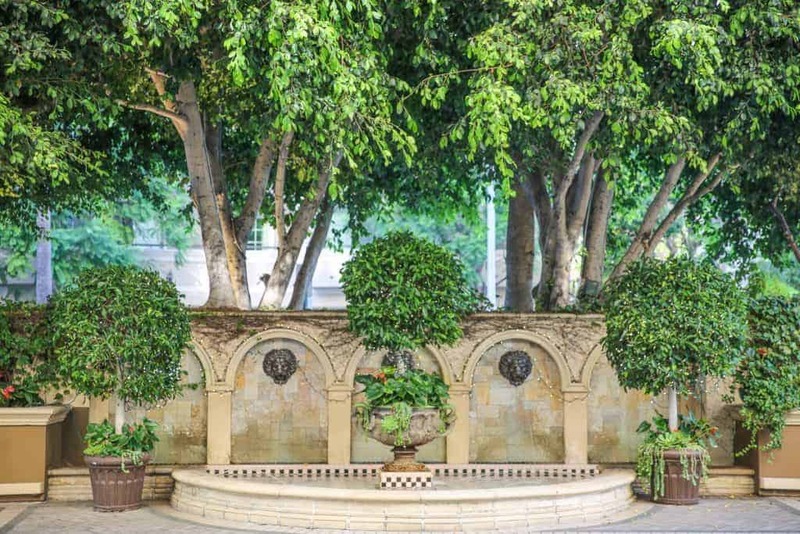 Every exterior space at the Four Seasons Hotel Los Angeles at Beverly Hills is designed as an exclusive haven in the city. No one visiting Los Angeles wants to spend that much time driving in Los Angeles with kids. The Four Seasons Los Angeles is perfectly located near most activities families would enjoy. Santa Monica, the Hollywood sign, and the film studios are a twenty-five minute drive or less. The Getty Center, The Broad, and LACMA are an easy reach, too. Our Los-Angeles based contributor has outlined the best Los Angeles-area museums to take kids. Beverly Hills destinations are within easy reach by the hotel’s Bentley. Most luxury hotels make statements in their hotel lobbies with flowers. But Four Seasons LA makes a Gettysburg address. I first saw the work of Jeff Leatham, undeniably the most famous hotel florist, at The Four Seasons George V in Paris. I had always loved hydrangeas but never knew just what these beauties were capable of until I saw how Jeff had transformed the lobby and dining areas on one June afternoon. The Four Seasons LA was where he got his start and has been elevated to rock star status. His hunky ads bearing his portrait adorn the elevators with “He’s back.” Honestly, if you appreciate floral design, they are both hotels worth visiting while you are in LA or Paris. The hotel has a side lawn used for weddings that makes a great running around space for little ones. The hotel greets children by offering them a toy. Children can choose a car or a plush Four Seasons purse with a puppy inside. 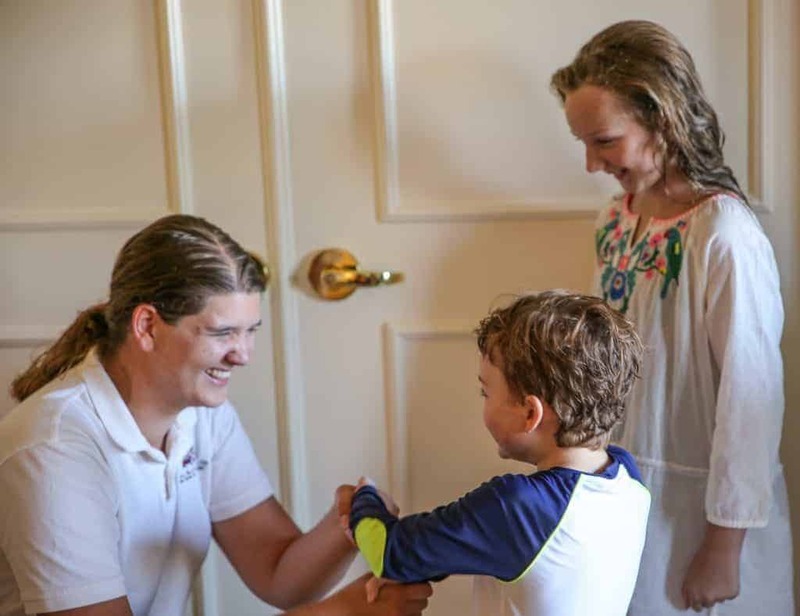 The Four Seasons, as a brand, does a wonderful job making kids feel welcome, and my kids’ names were affixed to the shower door as a surprise, adjacent to a hook with two adult and two child-sized bathrobes. 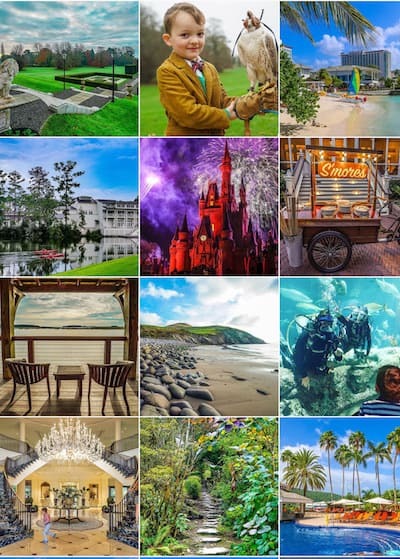 Join the Luxe Family Trips Facebook group where well-traveled parents advise one another on where to stay. 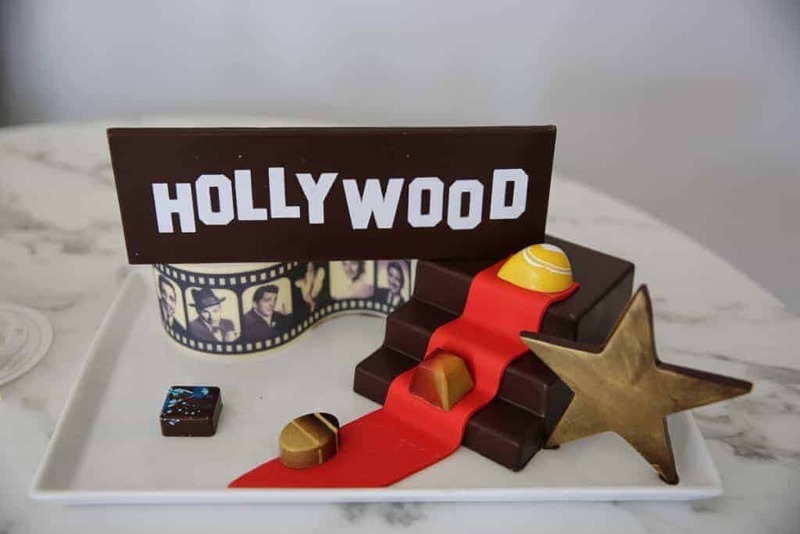 Their favorite, of course, was a chocolate amenity of the Hollywood sign. The Four Seasons staff can really do magic for their younger guests with the appropriate advanced notice (at least three days). Don’t expect it if you just show up with your kids. The hotel has recently begun a room renovation, and our suite was displaying a stylish new combo of glossy black doors, pale gray walls, with an emphasis of whites and metallic accents. The California suite worked well for a family of four as the living room with sleeper sofa could still accommodate one roll-away bed. Both rooms are separated by draped French doors for visual and sound privacy. Many rooms come with balconies of Beverly Hills views, but I am not sure a specific view is a selling point with this location. The side street location means even rooms on lower floors feel quiet. My favorite detail of the room was an exquisite floral arrangement of bold colors matching Jeff Leatham’s work in the lobby area. I had to protect it fiercely from ice tongs. The Four Seasons Los Angeles has one primary restaurant whose brunch is the Sunday event for locals. The buffet brunch is an expansive offering of a variety of cuisines. An adorable toddler height table is set up for children, too, with beautifully presented crudité, fruits, and kid classics. La Culina offers exterior patio seating and a similar menu can be had poolside, at Cabana, too. Every meal we had, our children were perfectly accommodated with healthy and familiar favorites. Room service even presented their breakfasts on colorful children’s plates. I love that I can always request extra steamed broccoli or whatever healthy special request my kids will actually eat, and that the answer is always yes. The Four Seasons does a spectacular job at many of their properties converting city hotel spaces into tranquil and manicured resort rooftop landscapes (the Four Seasons St. Louis comes to mind), and this lime green pool is no exception. 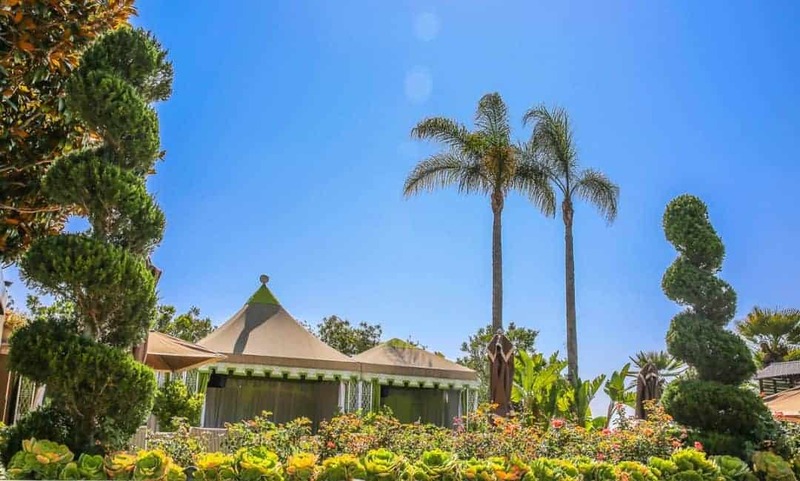 There are rows of bungalows immediately facing the pool that one family had claimed and had filled with toys and mermaid tails, and there were additional bungalows tucked away for peace and privacy. The pool area had an automatic tanning machine to spray sunblock that I had never seen before, but it was out of order. The outdoor fitness center was my husband’s favorite part of the hotel stay. Poolside service was flawless, of course, and I loved exploring the dense gardens separating the pool and alfresco restaurant. My kids are not loud at swimming pools, so it felt perfectly family friendly to us, though I doubt an energetic game of Marco Polo would go on without a few glares of annoyance. 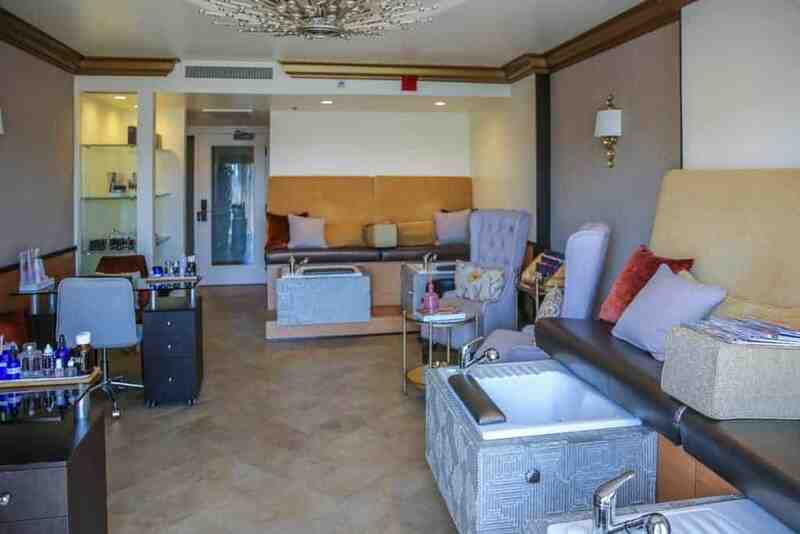 The Four Seasons LA has a wonderful nail salon space near the pool and spa for a mani-pedi appointment. 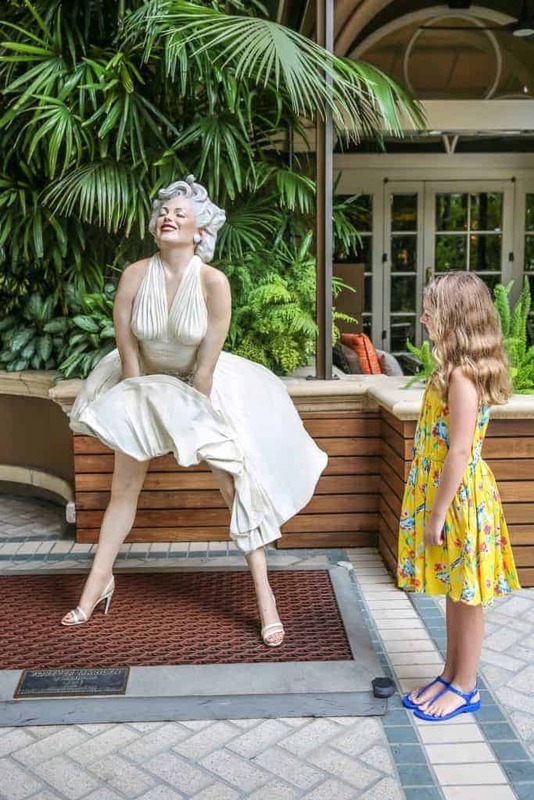 Although we found the Four Seasons Los Angeles to be welcoming to families, parents should model a chill and jaded air and show children how to remain calm when so many A-listers walk by. There’s tourist. And tacky tourist. 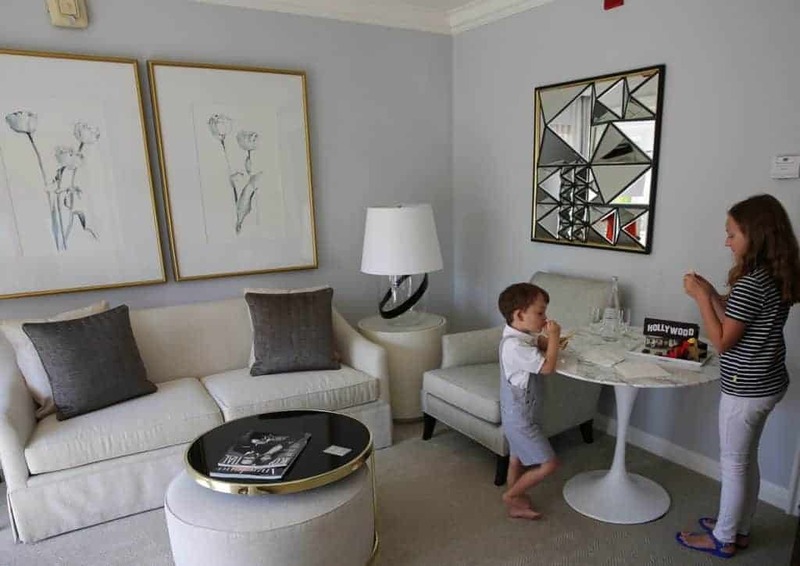 Visiting city hotels without kids’ clubs may deter families from enjoying vacations that big cities can offer in terms of dining, shopping, and culture. 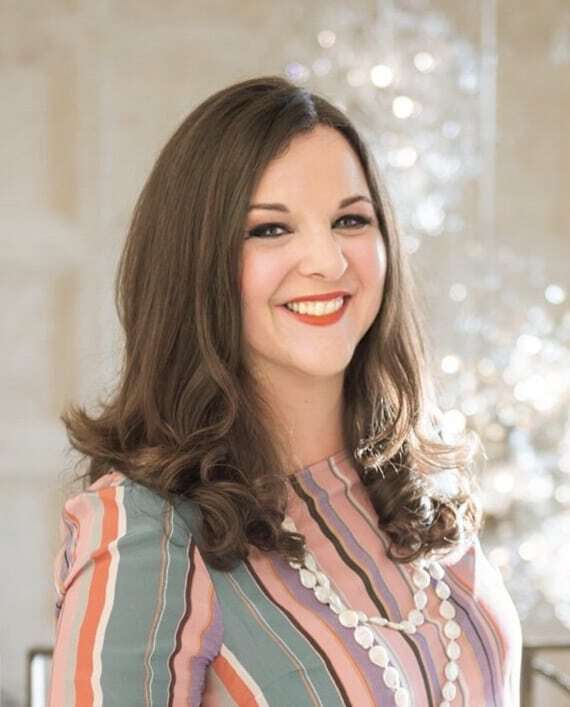 Sitters In A Second, Inc. is a Palm Beach based babysitting service that I have used several times with great satisfaction, I was was delighted to use them on the West Coast in addition to Orlando, Miami, and Palm Beach. You can request a sitter who swims and is a certified life guard, and then parents can go visit the new Broad Museum guilt free. A warm goodbye with our babysitter from Sitters in A Second. Sitters In A Second, Inc. provided their services complimentary in exchange for inclusion in this article, but no one would use a babysitting service they didn’t trust. 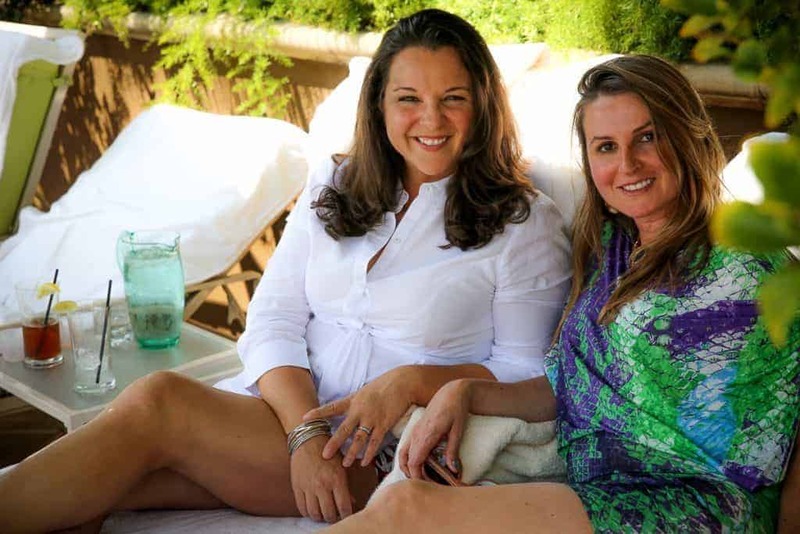 Robin and LA-based contributor Jillion enjoying a chat poolside. Check your dates for rates at the Four Seasons Hotel Los Angeles at Beverly Hills.